Queen’s University students have secured six of the thirty leadership places available on the prestigious 2017 Washington Ireland Programme (WIP), to build the next generation of leaders across Northern Ireland and Ireland. The successful candidates were chosen following a rigorous application process. Over 380 applications were received from 19 different universities and colleges on the island of Ireland and beyond for the twelve month programme. Founded in 1995, the Washington Ireland Programme includes a two month summer internship in Washington D.C. where students gain leadership training and experience in an area matched to their skills and interests. Previous students have interned in the offices of the then U.S. Senators Barack Obama and Hillary Clinton. The WIP Class of 2017 was announced last month in Washington D.C., when Sir Malcolm McKibbin (Head of the Northern Ireland Civil Service) – who will receive an honorary degree from Queen’s later this year – remarked: “The Programme has had the support of the Northern Ireland Executive for almost ten years. Prominent WIP alumni include members of the Irish Government, Northern Irish Executive and Northern Ireland Assembly. WIP alumni from Queen’s University include former Justice Minster Claire Sugden and former DUP MLA Emma Pengelly. For over two decades, WIP has played an important role in post-conflict Ireland by bringing together young leaders from a wide range of communities and backgrounds for an outstanding leadership and skills-development program. WIP participants are challenged and equipped to reach their full potential in embodying the two core principles of WIP – service and leadership. 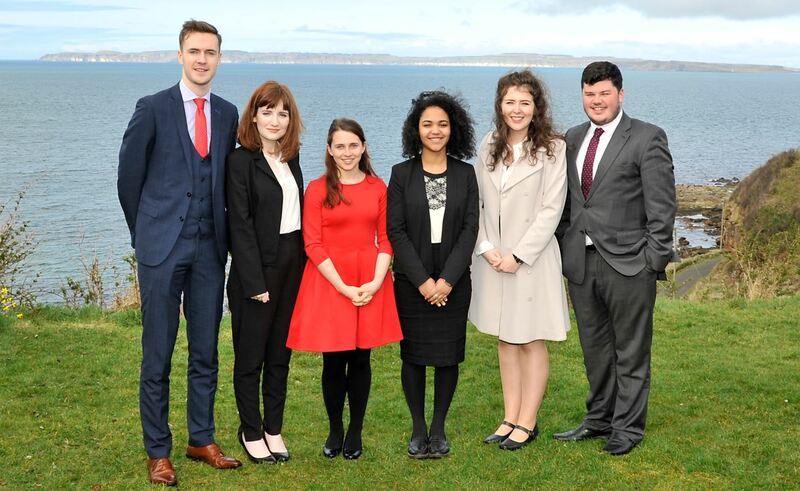 Caption: The six students from Queen’s who have been selected for the prestigious Washington Ireland Programme to build the next generation of leaders across Northern Ireland and Ireland are: (L – R) Kyle Moutray, Rachel Watters, Cordelia McGeown, Kier Oluwunmi, Tara Grace Connolly and Robert Murtagh.